This is a tasty vegetarian dish. Place oil in a frypan and fry the cubed pumpkin until cooked through, and season to taste. In a bowl, combine chickpeas, oil, cumin, cinnamon, and chilli. Place chickpeas in a frypan with oil and heat through. Sprinkle chickpeas with seeds and drizzle with honey. Fry until chickpeas look golden. Prepare couscous. Fluff with a fork to separate grains. Stir zest and juice through. 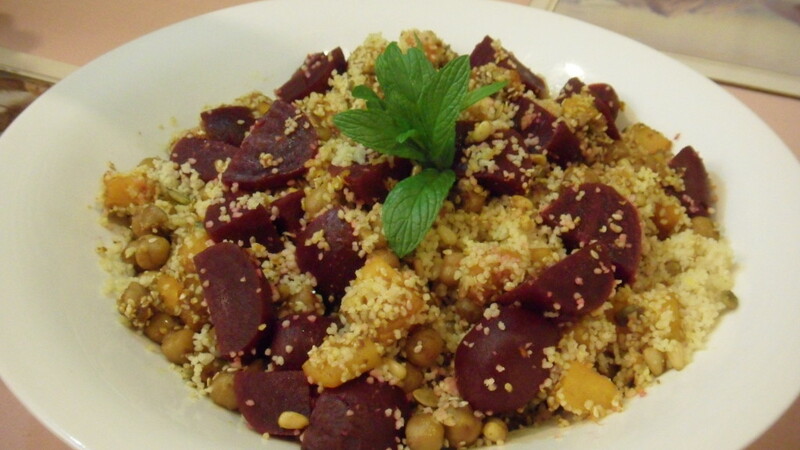 In a large bowl, gently toss couscous with chickpeas, pumpkin, and beetroot. Season to taste. Scatter with mint to serve. Tip: roasted courgette or capsicum can be added. The mixed seeds we used were: sesame, pumpkin and pinenuts. To give the couscous added flavour, dissolve a stock cube in boiled water and pour the water over the couscous to just cover it. We changed the recipe slightly during preparation of the pumpkin and chickpeas – we cooked ours in a frypan whereas the original recipe said to place them in the oven. Preheat oven to hot, 200 degrees celsius. Spray a large oven tray with oil. Spread chickpeas over half the tray and place pumpkin on the other half. Spray pumpkin with oil and season to taste. Bake for 10 minutes. Sprinkle chickpeas with seeds and drizzle with honey. Return to the oven for a further 5-10 minutes until pumpkin is tender and chickpeas are golden. Cut the tofu into cubes and marinate in a mixture of olive oil, grated ginger, soy sauce, and finely chopped garlic. Heat a frypan and fry tofu in olive oil. I had the marinated tofu to accompany my Pumpkin and Beet Couscous, and everyone else had roasted chicken. Pumpkin and Beet Couscous with Spicy Chickpeas recipe from: Woman’s Day, issue of June 2, 2014, page 66.